Although the fixtures remained in the same location, we gutted everything and replaced the window. A new tub, custom vanity and custom storage, limestone counters and glass-tile accents make this bathroom clean, elegant and modern in a subdued manner. 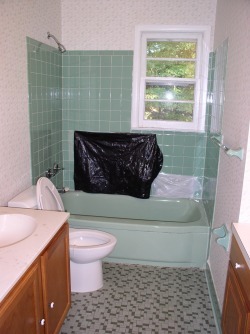 The old bathroom was late '50s with tile falling off the wall. The toilet was the only upgrade. A new fiberglass tub, a niche with glass tile inside, a new casement window and glass tile accents make a beautiful new bathroom. A sliding framless door and the limestone countertop and the undermount Kohler sink are stunning.